Does war have a distinctive odor? What did the trenches of the Great War smell like? We know, these questions may sound senseless or at least bizarre. And we acknowledge that the sense of smell, unlike vision or sound, is hard to recreate in the history. It always demands a personal contribution in memory and fantasy, trying to connect the words that describe an odor in the past with stimulus or objects that we have directly perceived in our present life. Yet it is worth to ask such questions, since they point out not a secondary aspect of the conflict. You just have to read some war diaries, a few at random of the most renowned poems of the period or observe one of the hundreds of photos concerning WWI and the life in the trenches and you’ll probably always come across the same smell-images: the odor from the poorly maintained sanitary facilities, the mud and the stagnant water, vapors from camp kitchen and smell of wet dogs, the troops living in tiny places and not bathing for long periods, the gas and the gun powder, bad quality tobacco, the wounded, the decaying of human and animal bodies. We can imagine, mixing some personal feeling and experiences according to the principle of “similitude”, but we are at the same time almost sure that we miss the whole. Because it is impossible to find words enough effective to describe the atmosphere breathed in the trenches. As if it was not enough the reality of the war, however, the sense of smell may be placed at the centre of the history of the Great War not only as a distinctive feature of the everyday life of the soldiers. Already before the beginning of the conflict it became a powerful instrument of propaganda, a strong argument in creating a culture of hate against the adversaries, as Juliette Courmont demonstrates in her book entitled L’odeur de l’ennemi. 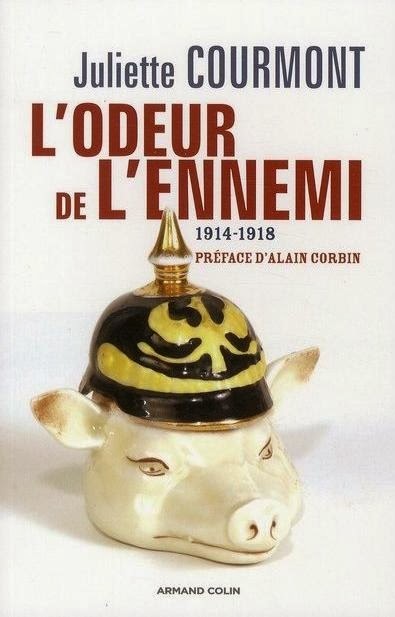 1914-1918 (Paris, Armand Collin editions, 2010). This original and captivating work describes a neglected aspect of the history of WWI, offering a detailed analysis of different sources (from newspapers to private correspondences, from scientific essays to soldiers memories). So we learn that few months after the beginning of the war in France everybody appeared to be firmly convinced that the coming of German troops was always characterized by a smell so nauseating that even objects and places were subsequently filled with it. And this idea was not simply a product of the propaganda, it was much more rooted in the collective mentality, constituting a preconception that nobody could question. After all even the scientific community cooperated to support it. The French doctor Edgar Bérillon, especially, interpreted the fable of the intolerable smell of the adversaries as a consequence of a physical defect in controlling the sweating and associated then this “diagnosis” with specific “race characteristics” - ranging from the nutrition to the moral features – which found their climax with the caricature of the pig. Bérillon collected his thesis in a book – La Bromidrose, 1915 – which had an impact both in the medical discussion and in the mass media, claiming to provide a “scientific” justification to the widespread prejudice. Besides the historical reconstruction, the author succeeds therefore in disclosing the multifaceted mechanism which combines in a dialectic way scientific (we would rather use today the word “pseudo-scientific”) arguments and unconscious cultural construction and creates so the idea of the “smell” as a central feature of the collective national identity. If we read the sources today, maybe sitting on the sofa, it’s hard to understand how such a prejudice could inform the perception of the French population and troops. Especially, if we turn back to the opening images, it’s hard to understand how one could pretend to have a “more agreeable smell” sitting in a trenches, since no matter on which side of the no man’s land, the odors were the same. And yet, in this inadequacy of understanding, we can maybe grasp how the sense of smell constantly fluctuated during the WWI between a cultural and a physical reality.